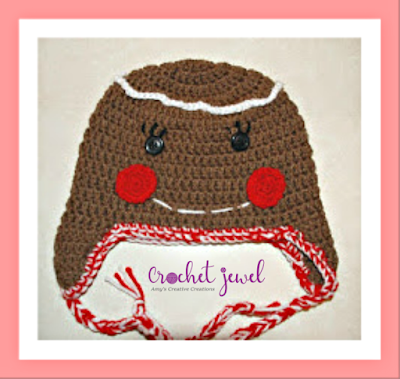 Crochet Gingerbread Man Hat is great for the holidays or just for fun! I Made this for a Toddler. rnds 6-desired length (lengths are listed above), Ch 3, (Counts as first Dc), dc in each dc around, sl st to join. -55 dc, *Repeat to length that is about 7 inches long or to your desired length, Slip stitch. 1st ear flap, you can slip stitch onto the side of the hat with your brown yarn, begin the dc stitches, (like to have the seam in the back of the hat, so I do the ear flap on the side of the hat). The braid from the center of the ear flap at the bottom, G hook, use red and white yarn yarn, with a sl st in the center of the bottom of the ear flap and chain 30, and sl st it off and cut yarn. Optional: White line frosting on top of the hat: white yarn, G hook, chain 85 and sew in the chained line on top of the hat making it bunched up around the hat. Eye lashes: use a yarn needle and sew with black yarn 3 dash lines above the button eyes. do this for each eye. Smile: Use a yarn needle and sew in a smile dash lines from one cheek to the next red circle cheek.he next red circle cheek.